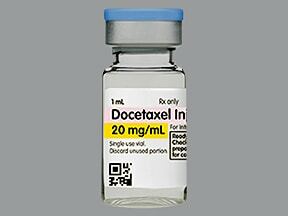 Who should not take Docetaxel Vial? 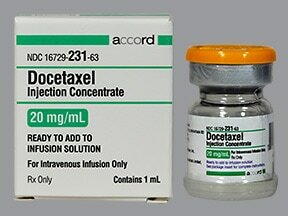 What conditions does Docetaxel Vial treat? 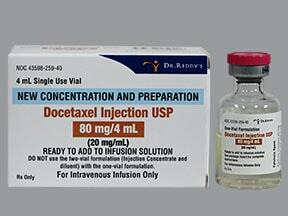 Pain or swelling at the injection site, nausea, vomiting, diarrhea, excessive tearing, fatigue, dizziness, drowsiness, feeling drunk, constipation, and loss of appetite may occur. 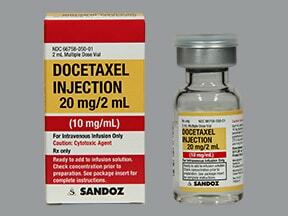 Nausea and vomiting can be severe. 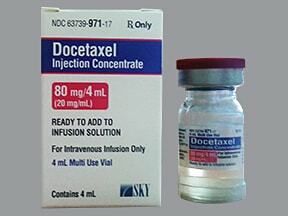 In some cases, drug therapy may be necessary to prevent or relieve nausea and vomiting. 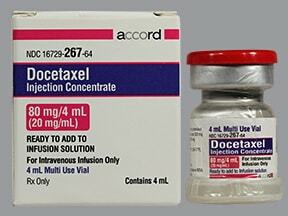 Not eating before your treatment may help relieve nausea and vomiting. Changes in diet such as eating several small meals or limiting activity may help lessen some of these effects. 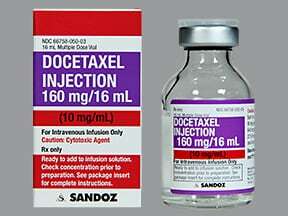 If these effects persist or worsen, notify your doctor or pharmacist promptly. 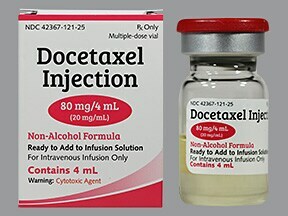 Tell your doctor right away if you have any serious side effects, including: swelling of the hands/feet/legs, unexplained weight gain, numbness or tingling of the hands or feet, muscle or joint pain, persistent weakness or fatigue, eye pain, irregular heartbeat, severe stomach pain, black or bloody stools, severe headache. 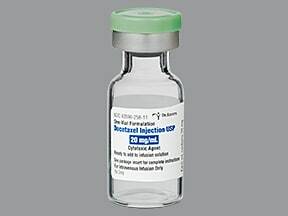 Get medical help right away if any of these rare but very serious side effects occur: chest pain, vision changes (such as blurred vision, decreased vision, seeing flashes of light). 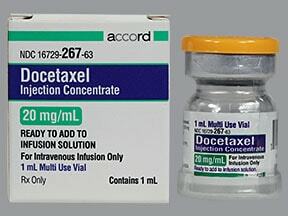 List Docetaxel Vial side effects by likelihood and severity. 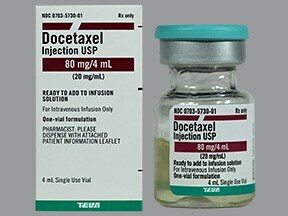 Before using docetaxel, tell your doctor or pharmacist if you are allergic to it; or if you have any other allergies. 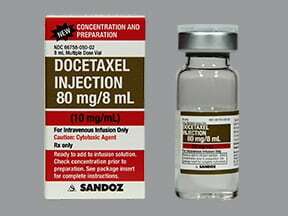 This product may contain inactive ingredients (such as polysorbate 80), which can cause allergic reactions or other problems. Talk to your pharmacist for more details. 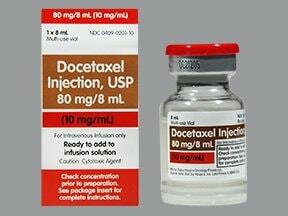 Before receiving docetaxel, tell your doctor or pharmacist your medical history, especially of: liver problems, lung problems (e.g., pulmonary effusions), heart problems (e.g., congestive heart failure), weak immune system (e.g., neutropenia), blood problems (e.g., anemia, thrombocytopenia), blood pressure problems. 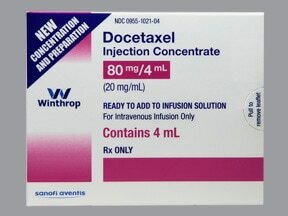 This medication may make you dizzy or drowsy. 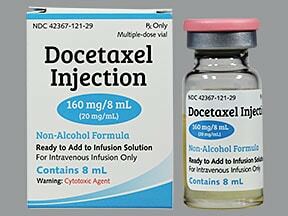 It also contains alcohol, which can increase these symptoms and also make you feel drunk. Caution is advised if you have liver disease or any other condition that requires you to limit/avoid alcohol. Marijuana can also make you more dizzy or drowsy. 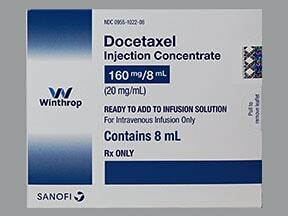 Do not drive, use machinery, or do anything that needs alertness for 1 to 2 hours after you receive this medication and until you can do it safely. Limit alcoholic beverages. 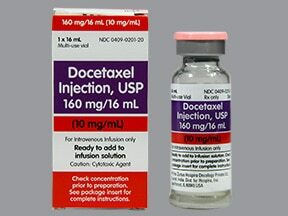 Talk to your doctor if you are using marijuana. 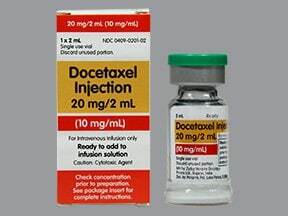 Caution is advised when using this drug in the elderly because they may be more sensitive to its effects, especially anemia, dizziness, diarrhea, infection, swelling, mouth sores, and weight loss. 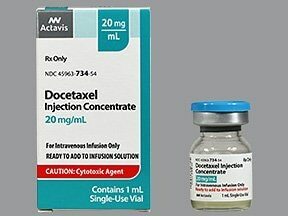 This drug is not recommended for use during pregnancy. 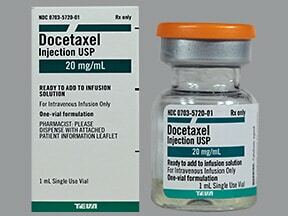 It may cause harm to an unborn baby. 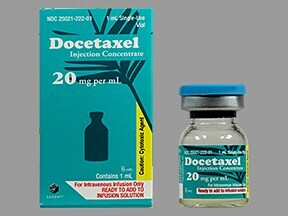 Consult your doctor before taking docetaxel and discuss the use of reliable birth control methods during therapy and for 3 months afterwards. 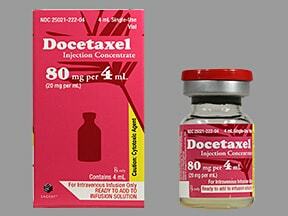 If you become pregnant or think you may be pregnant, inform your doctor right away. 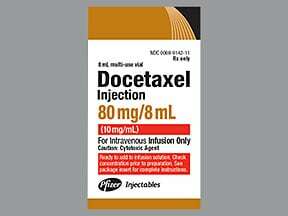 What should I know regarding pregnancy, nursing and administering Docetaxel Vial to children or the elderly? 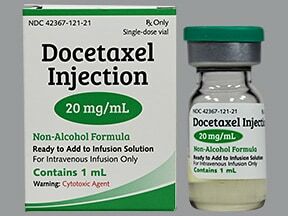 Some products that may interact with this drug include: medications that may have a bad reaction with alcohol (such as disulfiram, metronidazole, tinidazole). 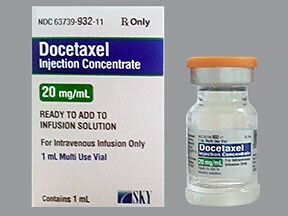 Tell your doctor or pharmacist if you are taking other products that cause drowsiness such as other alcohol-containing medications or alcoholic beverages, marijuana, opioid pain or cough relievers (such as codeine, hydrocodone), drugs for sleep or anxiety (such as alprazolam, lorazepam, zolpidem), muscle relaxants (such as carisoprodol, cyclobenzaprine), or antihistamines (such as cetirizine, diphenhydramine). 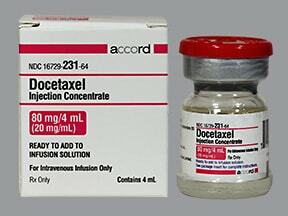 Does Docetaxel Vial interact with other medications? Not applicable. 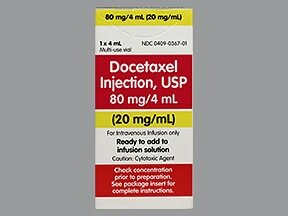 This medication is given in a clinic and will not be stored at home.Information last revised July 2017. 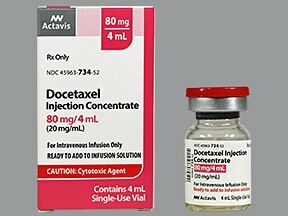 Copyright(c) 2017 First Databank, Inc.
Are you taking Docetaxel Vial? 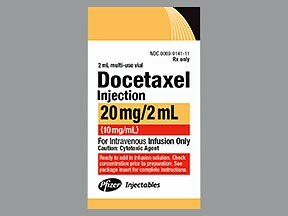 Are you considering switching to Docetaxel Vial? 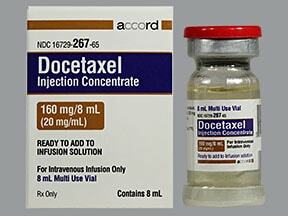 How long have you been taking Docetaxel Vial?